Price, they’ll tell you, is only one of many, many considerations. Quality and reliability are invariably more important to experienced users. The big and smart crowd tends to go with industrial-grade devices, and steers well clear of using consumer-grade PCs. Their reasoning is easily explained: they don’t want the grief. Industrial-grade suppliers like Advantech build devices that last and with specific demands in mind. A consumer-grade PC will tend to be designed and optimized for home or office uses, and corners cut wherever possible to drive costs down and stay competitive. An industrial-grade design has far different influencers on the design. Our newest product releases are not devices that “could” be used for things like digital signage applications. They’ve been specifically designed and optimized with digital signage projects in mind. 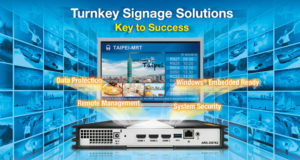 They’re turnkey solutions that make signage applications both simple and intelligent. The foundation is the silicon. Our new Advantech digital signage units use 3rd-generation Intel® Core™ i technology that boosts CPU performance by as much as 15% and 3D graphics performance by as much as 60%. That’s big when considering quality is measured, looking at displays, by the stability and smoothness of visuals. The ARK-DS262 is a tiny (200 x 119 x 30 mm) unit small enough to slide inside Intel OPS (Open Pluggable Specification) compliant displays that have built-in slots. That means the installation footprint for a PC and display is remarkably small, and servicing fast and easy. The units are powered by 3rd generation Intel Core i7/i3 CPUs, with built-in graphics, capable of running all the way up to 3D animations. Click here to read about the case study “OPS Media Player for the Digital Classroom : Let Kids See, Touch and Learn“. The ARK-DS762 is designed for advanced digital media player and signage projects. It uses the Intel 3rd Gen Core and has extra flexibility through optional expansion modules. The units can support three HDMI-driven displays with independent content streams, and also support interactive applications like Microsoft’s Kinect gesture technology. It’s the sort of unit that’s ideal for multi-display video wall applications in retail stores, stadiums, corporate lobbies, restaurants, hotels and other public spaces. Hardware is just part of the equation. We can layer into our solutions an embedded OS, remote management software, data protection, and network security services. That means our direct partners and their customers can quickly set-up, manage and operate in the field. All Advantech signage boxes can, on demand, come pre-loaded with an embedded OS, along with SUSIAccess remote device management software, Acronis data protection software, and network security software by McAfee. We’ve listened to business partners and end-users and done the work that makes it possible for them to focus more on their own applications and save important development time and resources. 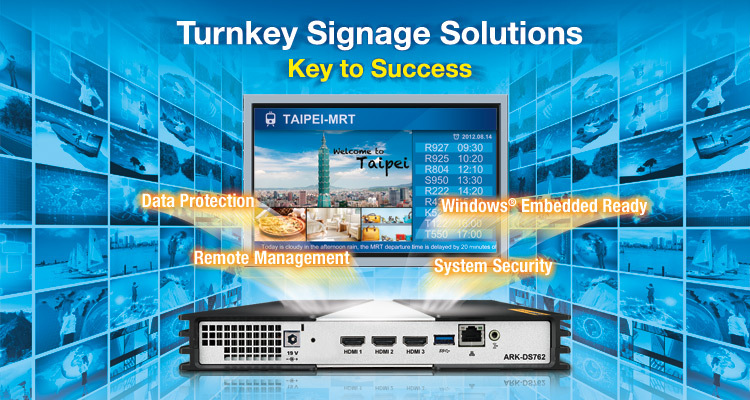 Turnkey is often sold in digital signage as an offer that means a company will do everything for a client – from software to management to creative. From our perspective, turnkey is more about ensuring what we provide is truly ready to go. We do the work and bundle the products so our customers don’t have to figure out what else they need to get units running, and then keep them running. This entry was posted in Digital Signage, Uncategorized and tagged 3rd Generation Core i, Intel OPS, open pluggable specification by admin. Bookmark the permalink.